Our resident manager Greg has been with The Wellington since 2012. Previously to joining The Wellington, Greg worked with teams in corporate social responsibility, customer service, and volunteer management. The Wellington is managed by Societies Management (SML), a locally owned and operated property management company. The professional management team manages over 1000 units in the lower mainland. SML is a family owned business established by the Wellington Society’s original founder who answered the call from the City to establish affordable housing for families in False Creek West back at the time when Granville Island was first being built and established. 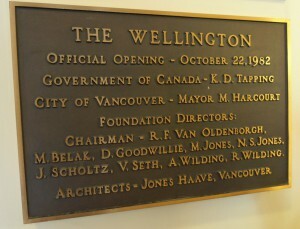 The building owner is The Wellington Society. It was established as a Society in 1972 by local Architect / Developer Norman Jones who used his own resources to develop and build The Wellington. The objectives of the Society from its inception and still strong today are to operate a strictly non-profit organization for the purposes of providing housing citizens within the Province of British Columbia who are unable to purchase adequate accommodation according to their needs. The Society has managed to hold strong to their mandate over the years by providing both low income and market housing within the same facility. The market housing enables the Society to subsidize low-income housing. The Society does not depend on any outside government funding to provide a fixed percentage of low-income housing in its tower at the Wellington. The Society does not depend on any outside government funding to provide a fixed percentage of low income housing at the Wellington. The seven directors on the board of the Wellington Society today include Norman S. Jones, Architect/ Developer for over 50 years, Chairman of the board of directors. The treasurer is a Minister who performs weddings and funerals in the Greater Vancouver area. The rest of the board of directors include a Sr. Interior Designer specializing in multi-family residential housing, a retired Senior’s Housing General Manager, a practicing Oral Surgeon, a retired Registered Nurse and a West Vancouver Businesswoman.